Looking to get our home back in full swing today and make it as efficient as possible, I went in search of charts. I LOVE charts and so do my kids. They love a list as much as their silly Moma. So a few lists, a few chores, some lessons, and we are back on the path to success... at least that's what we strive for. Both charts were found on pinterest. I printed out the chart below and wrote a general homeschool lesson chart for the week. 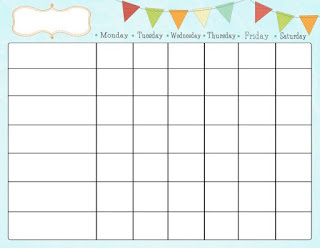 Giving attention to those areas in which each child will need different arrangements. For example, one of my children needs a bit more time in a certain subject. Where one may only have one lesson... another may need to work on that lesson plus a worksheet. Or, one of my children needs extra work to keep them from being idle... they get through with their work extremely fast, so I usually will give them "extra credit" work to do to help them to really grasp what they are doing. I want them to be productive without having to give them extra work so this is just optional for us. Some days we may need it, some days not. They are learning to be productive without having to have the extra, so we are learning together how they can best use their time. Another child loves to read and is an enthusiastic reader and will devour any book they are given. I try to allot plenty of time for reading, fiction and non-fiction. Every child is different and learns differently and that is perfectly well and normal. What homeschooling allows me to do is that I can work to help that child learn at their best. 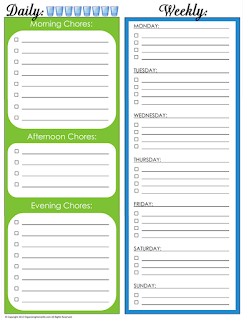 We also have this system going right now for our chores and it is working well. I wash dishes, one child puts the dishes away. That is their job for the day. Now we don't have a lot of plastic dishes or throwaways and we don't have a dishwasher, so I usually wash up a good amount of dishes several times a day. And because we don't have a lot of counter space, that person who does the chore for the day will put away once I am finished. Also, we have a laundry swapper of the day. That person will keep the laundry swapped all day long. Once laundry is done it is placed on the kitchen table for me. I will fold it and put it in piles for the next person. This person is the one who puts laundry away for the day. Again, we do several loads of laundry on Monday... usually a little less throughout the week, but normally a couple loads a day. So a few minutes throughout the day when I am finished folding, my helper will come along and put the items on the appropriate persons bed or will put towels, washcloths or dishcloths away properly. While it is winter, there isn't a whole lot of outside chores to do. But one is to feed/water the chickens and check for eggs. Another is to feed/water the outdoor cats. And the last outdoor chore is to take out trash. We alternate those jobs daily. And finally we have kitchen helpers, which is one of the most beloved daily chore jobs we have. Each of my children have a day of the week, when they are my kitchen helper. We have been doing this on and off for many years. They get an input on what we have for breakfast, lunch, and supper. I tell them what we have available in our pantry and freezer as well as what we have that is fresh. Then we plan our menu around it and prep throughout the day for the meals. When we are more organized, much, much more gets accomplished around the house. 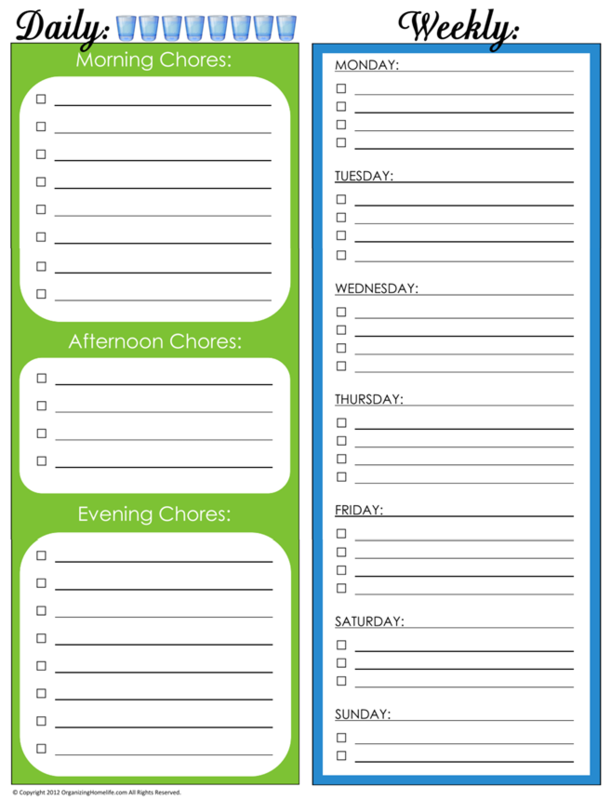 I also have weekly chore lists that include bathrooms and deeper cleaning jobs. The ones I've listed above are the daily jobs. Everyone has ways of making things work for them and their home. These are just a couple of things that help us. Most of all, jobs are about the heart and not just the job itself. We want our kids to learn to work hard. To work diligently and to work well.... because ultimately we are raising them to be men and women. Hard working, loyal, diligent workers who realize that everything they do is a reflection to WHO they serve. We want that reflection of the Lord to be a good one. If I had a dime for every list I wrote out, I'd buy a Hummer. If something is written down, excuses are fewer. You saw it. You read it. You should do it! I think the list I miss the most, is the one I had for Lydia almost every morning. Take the bucket to the mulch pile. Sweep the doorway. Brush Sheba. Take jugs to car. It takes me an hour to do all that. ...it took her, ten minutes. I remember you telling me about your list to Lydia. How sweet. I love lists... they are one of my favorite things. I understand what you are saying about missing Lydia. Cameo is still home, but with her working and having a boyfriend now, things are very different around our house. It's like my right arm is missing. I'm happy for her, but I miss her being here with me all the time too.